25.-27.12 We are spending our Cristmas Holidays and I been practising taking pictures of our new camera. Lots of Long walks in the woods and in the city. Little bit training and lots of resting. What more you could wish for the holiday. Here are lots of new pictures all the boys. 1.12 I find my mum's camera lots of pictures of Arttu when he was about 9 weeks. Here are couple of them. 30.11. Friday I drove in south Finland to my sisters family in Järvenpää with Arttu. It was nice to see my nephew and niece and I was promis to my sister and her husband to look after the children meanwhile they spend their time in Cristmas party. Saturday I drove to Klaukkala meet Arttu's brother Dano. Unfortunate I don't have any pictures of that meeting becouse my camera broken after it drops the ground. We also meet there Rudy (rr girl) and Sonja. Anyway all three having so much fun it would be allmost impossibleto take any good pictures. Thank you all for nice walk and coffee after that. Arttu was soo tired after walk and playing in Dano. 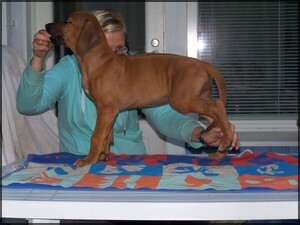 Sunday morning I again start my car and drove Helsinki city in the puppy Show. It wasn't easy to drive in city and I get lost and allmost be delayed the ring. Fortunately the ring was little late and I was able to take breath before we have to go there. Arttu was his happy "little" person and he got 1HP, BOB( he was only rr in the show ;)) and after long waiting he also be BIG-2. All the day was worth pain. 23.11. 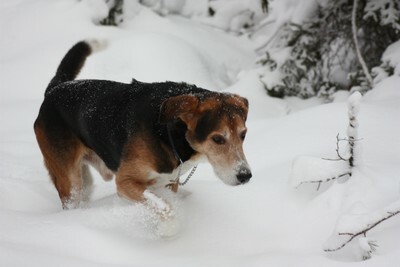 Today I have time to write about Arttu becouse here are snow storm. No one didn't want to go out so we enjoy the fire on the fireplace. 15.11. Today was a very firs Finnish RR Club Show at Lahti and we spent a lovely day there. The Judge of the day was Mrs. Cheryl Currie-Thompson from Austria and breed entry was a mighty 84. 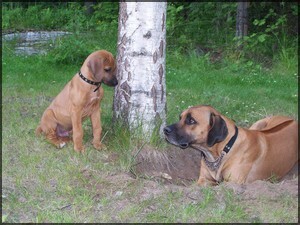 Arttu got HP in his class and then won all the puppy male and become BOB-puppy. I was so surprise of my little guy. That's not all for that day. Nemo got EXC in open male and won his class too, but no placement on the best male group but we were on the 8th best male group. What a day of my both boys!! I was so happy. This is Nemo's last show on this year. 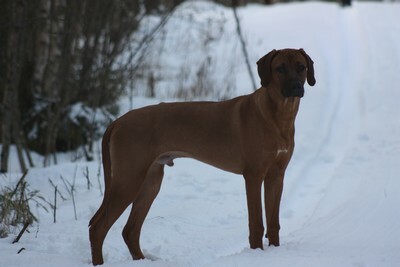 Arttu have a couple show last and then we start to enjoy the winter. 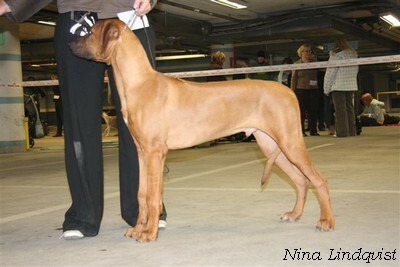 BOS was beautiful Babe Candy Hela Ridge "Prada"
8.11. Today we got nice gest. Arttu's brother Rampo and his family come to visited us. We went to long walk on the fores. To bad that wether was not so nice and I couldn't take more than couple pictures becouse was so dark. At least all the boys have so mucht fun. 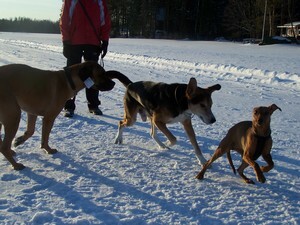 In the evening I have three tired dogs and I think Rampo was too sleeping hole trip back to Kuopio. 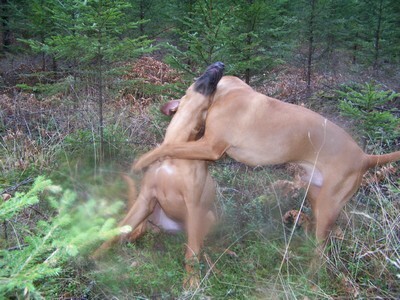 Couple pictures are little bit foggy becouse some one of the dogs liked the camera. 1.-2.11. 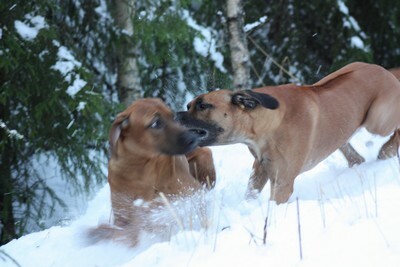 This weekend we spent time in pyppu Shows Espoo ( all breed) and SSKY in Vantaa. Both day went great and Arttu was his ouwn happy little person. 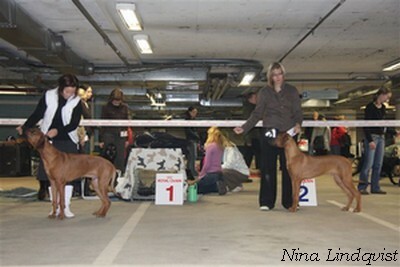 Saturday we were in Espoo and the judge was Tuula Savolainen. Arttu got 2nd and Hp. Sunday in SSKY (head organisation of Finnish RR club) Show the judge was Soile Bister and again Arttu got 2nd and HP. Judge say that Arttu needs time to develop in body but both critique were excellent. You can read more the critique here. 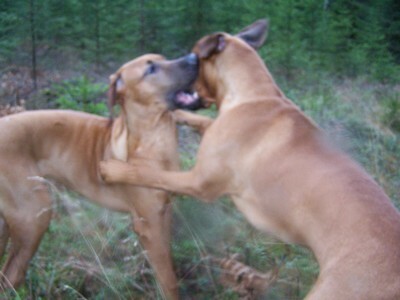 12.10. we was in puppy meeting and we met 8 Arttu's siblings. 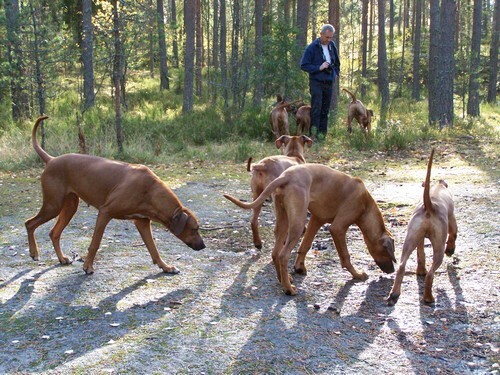 All the puppy have suchs a lovely day. Here are pictures of that day. 21.9 Today we went to Match Show with the boys. Nemo went to open class and got the blu ribbon and placing in second. 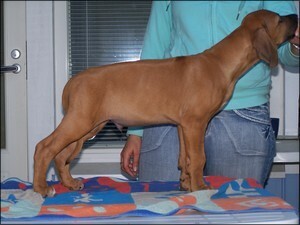 Arttu went to puppy class and wont the class but no plasing in BIS group. I was so proud of Arttu. He showing his teeth and waving his tail all the time. After that we went to forest with Jenni and Hugo. All the boys having so fun. Here are couple pictures of it. 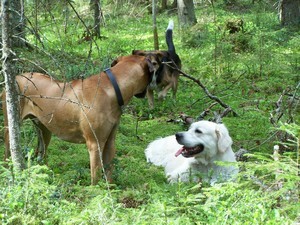 Arttu and Hugo with the stick. 19.8 I start to fieldtrackking with Arttu. He is so good and eager to doing that. 9.8 Group show in Ristiin. Nemo got again VG2. The critiqui was very good so it doent's annoy very much. Show result you find here. 11.7 Long waiting summerholiday is here. So no Updates for a momont. We are meetings our friends and enjoy the summer. 8.7.Today I weight Arttu and it was a lot. 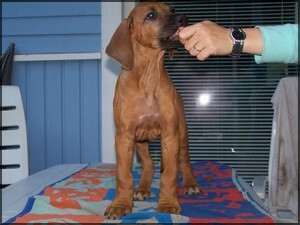 Almost 9 weeks and he's weight was 9,7 kg. I try to took some standing pictures and it was hard. Here are couple of them. I am gute or what? Finally I got it! Even Nemo get used to him day by day and this close they can be now. 28.6. Järvenpää all breed show Nemo got again VG2. 12.6. 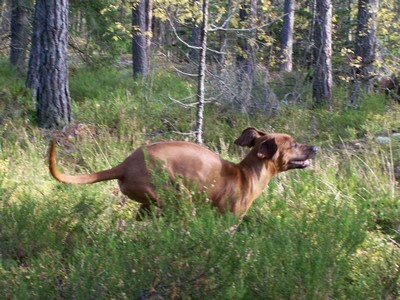 Today we went to Pieksämäki obedience trail. Nemo did something and something he didn't do. So no result in first time. 25.5. 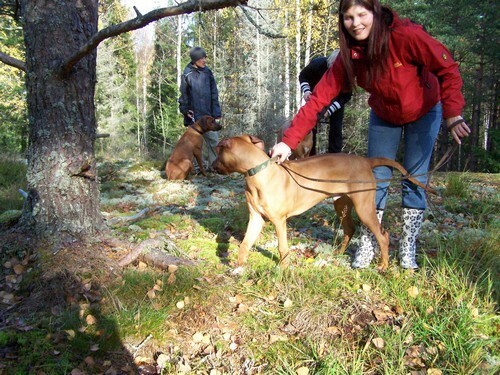 Hugo and Jenni come to visit us and we went to walk in forest. I took photos on boys. Pictures finded in gallery May 2008. 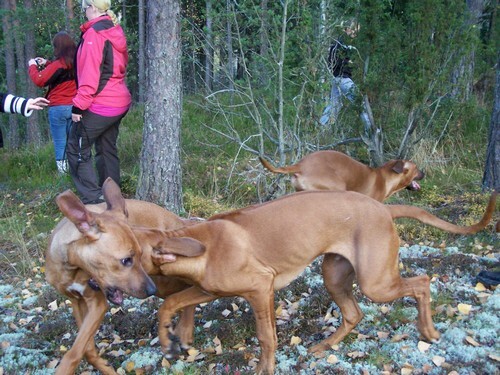 18.5 Today we went to Jämsä group show. Nemo got VG2. Critiqui added in show pages. 20.4 Nemo got G at Jyväskylä International show. 5.4. 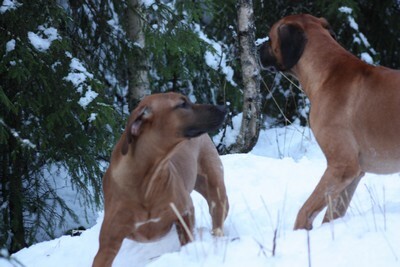 Nemo and I entered our fisrt aglity trial in Varkaus. Nemo did great job but I messed up and we got disqualification both track. This is good continue. Agility result updated. so much fun (at least Nuka had...). The wether was so perfect. The Sun was shining and it wasn't windy on the ice. Here's more pictures. 26.3. Yesterday's I finally sended our first Agi competition registration. 22.3. 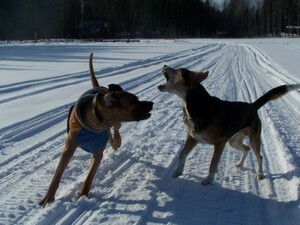 Today we went on the ice for running here's couple pictures of it. 16.3. updated pages in english. 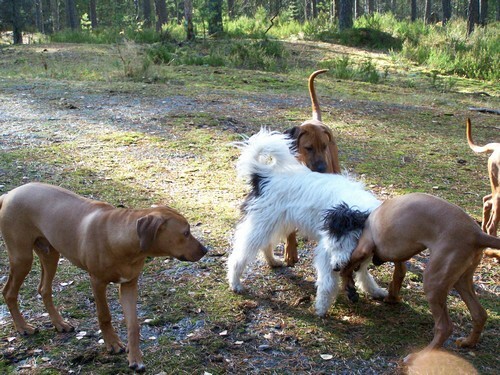 Today we was agility training and we had realy track. Nemo was good. First track we get 5 faults and time was 59.17. Second track we get 10 faults but time was 57.67. Maybe now I finally dare to register our first official competition. 8.3. Lisätty kuva-albumiin uusia kuvia. 24.2. Varkauden palvelus-ja seurakoirat ry palkitsivat meidät Nemon kanssa vuoden parivaljakkona. Pikkuhiljaa koitan lisäillä näille sivuille uusia kuulumisia ja kuvia koiruleista. 22.2. Avattu uudet sivut ja lisätty tulevia näyttelyitä.